I couldn't let the day go by without talking about this week's big topic: The Royal Wedding. I haven't been paying too much attention to all of the speculation leading up to today about dresses, hair, etc, but I was excited to watch it. Even though I had to work a full day today, I wanted to at least try and get up early to watch it (I did DVR the Today Show's full show hour coverage just in case I couldn't wake up). My alarm went off at 3am, but that was just a bit too early so I snoozed for an hour and turned on the TV around 4am just in time to watch the final guests and wedding party arriving. I told myself I would just watch until Kate walked into the church and go back to sleep, but I ended up watching the ENTIRE thing: Kate leaving the hotel, the arrivals, the full hour ceremony, the carriage rides (I did jump in the shower during this part), the first kiss, the second kiss, everything! I'm pretty tired, but it was worth it. This is one of my favorite pictures. To say Kate looked stunning is an understatement. Her dress, hair, veil, jewelry, makeup, all was perfect. I am also in love with Pippa- love the name, love her dress, love her! She did such a great job with all of the children, Kate's train, and looked fabulous while doing it. I love her dress so much and think this one will get replicated just as much (if not more) than Kate's dress for bridal gowns. 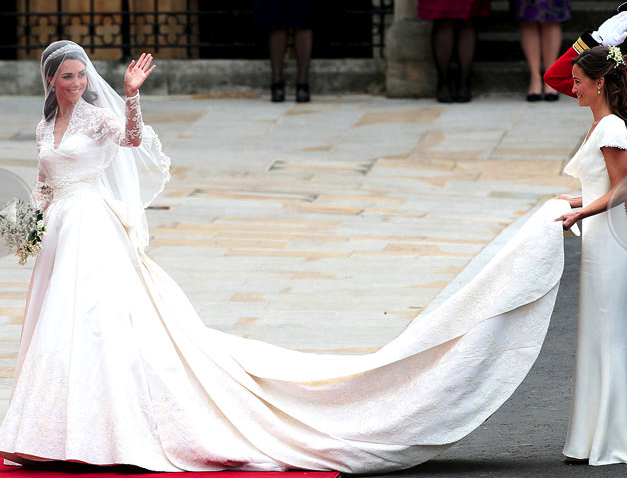 Props to Kate because I just don't know that many brides who would be confident enough in themselves to let the maid of honor (with a killer figure) where such a stunning white gown at the wedding. The blogs are already going crazy about the appropriateness of Pippa's white dress, but I loved it and thought it was sweet and classic, but with a nice modern twist. And one final note...Pippa Purifoy? Thoughts? If not for my child (no, I'm not pregnant) I think we will see this name spike in popularity this year. Now Pippa and Kate - go enjoy some wedding cake. You both look great, but a little hungry!